MAGNIFICENT MILE — Saying it was time to get the attention of Chicago politicians and business leaders, hundreds of protesters angry over the shooting death of Laquan McDonald marched down Michigan Avenue on Black Friday. 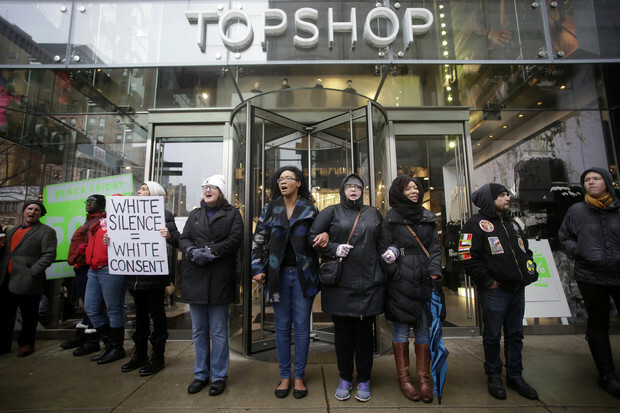 The group's aim was to disrupt Black Friday shopping by shutting down Michigan Avenue and physically blocking shoppers from entering or leaving iconic Magnificient Mile stores. "Today we shut down the politics and commerce of Chicago," said protester Mark Carter. "That's all they understand. Maybe then they can understand our situation"
The protest started at Wacker Drive, with marchers taking over all the northbound lanes of Michigan. Eventually they took over the whole street and marched down the city's busiest retail stretch to Water Tower Place. As protesters snaked through the cars stuck on southbound Michigan Avenue, some stuck drivers started honking in solidarity. "It actually doesn't bother me," said Sterling Powers, who was stuck in traffic. She showed her solidarity, honking her horn to the rhythm of the protesters chants and giving the thumbs up out her window. "It's inconvienent for us in America all the time — African-American, Pan-African — it don't matter," said Powers, a Jamaican immigrant. "So we can be inconvienenced for a little bit for this." Asked why she thought to honk her horn, she said "because  shots is ridiculous." The hundreds of protesters made their way from Michigan Avenue and Wacker Drive down to Michigan and Chicago, where organizers addressed the crowd from the steps of the water tower. Their instructions were to make lines of protesters in front of nearby stores. One man, Grant Newburger, used his bull horn addressed shoppers directly. "Today, there is no shopping on Michigan Avenue," he said. "Because Laquan McDonald won't have a Christmas. Rekia Boyd won't have a Christmas. "If it was your sons and daughters, you'd be out here too," he said. In many cases, police had already blocked off the stores and ordered stores to not let anyone in or out. Many shoppers inside American Girl Place and Macy's at Water Tower Place could be seen pacing by the closed front doors of the store, not able to leave. A security guard at Water Tower Place said management made the decision to temporarily close the building with shoppers inside. It would open up its doors when police deemed it safe, he said. Barricades were erected outside of the Macy's at Water Tower Place. The protest did bother some shoppers, many of whom said they were from out of state and only had the day to check out Chicago's Mag Mile stores. There were confrontations between protesters and frustrated shoppers, who in some cases enlisted the help of nearby police to get into stores. "I understand the protest, but there's got to be a better way," said Sue Hahn, who came with her family from Southwest Michigan. She was turned away from American Girl Place. "It's inconvient. We planned this for two months," she said. "But what can you do." Other shoppers understood why the demonstrators were angry. Bonnie Pugh was on the Mag Mile visiting with her two kids from Columbus, Ohio. Her son asked her what people are doing. "Well, they shot a man 16 times and they're mad," she told her son. "I guess it's education for my kids," she said. "They've never seen anything like this." She said she agreed with protesters' right to march, but questioned the idea of blocking shopping, especially in an area populated with non-residents. "All these people should be in jail," said one man to police letting him back in to Macy's at Water Tower. But Rev. Michael Pfleger said money is the only thing the political powers care about. "The only thing that makes people listen is money," he told reporters. "People are angry. It's time to say, 'business as usual is over.'" Police, though, blocked entrances to a number of shops, including Macy's and the Water Tower Place mall. Michigan Avenue was closed for more than four hours, well after the holiday lights lining the streets lit up. Drivers and shoppers returned to the area shortly after 3 p.m., though some protesters remained in front of stores like Apple, Niketown and Coach. The demonstrations closed Michigan Avenue from Wacker Drive to Chicago Avenue for much of the afternoon. On Thursday, the Chicago Teachers Union urged its members to take part in the protest. “When we take to the streets on Friday we will show the city that we intend to disrupt its economic center as we call on people of good will to join us in our fight for justice for Laquan and other victims of questionable and unjust police shootings in our city," union President Karen Lewis said in a statement. Noted South Side pastor the Rev. Michael Pfleger had already put out a call for his congregation to take part in the protest to disrupt the anticipated crowds and draw attention to the McDonald shooting and other cases of police misconduct. "If you really want to make a statement: Black Friday is coming up. The number one business day," Pfleger said. "Don’t shop on Black Friday and go down to Michigan Avenue and sit down in the street and block the street on Michigan Avenue with civil disobedience peacefully, and say 'business as usual can’t go on while our children are dying.'" At an unrelated press conference Friday morning, Police Supt. Garry McCarthy said officers would continue to "facilitate" the protesters rights to free expression. "But we will not stand buy and let criminal activity happen," he said. He went on to praise the way his department has handled the protests so far. "I am astounded by the professionalism of these men and women," he said. "That's why we're not having the problems that these other cities are having." The teachers union's statement endorsed the march in protest of the "horrific" October 2014 shooting of McDonald, which was caught on video that was released to the public Tuesday. Chicago Police Officer Jason Van Dyke on Tuesday was charged with first-degree murder for McDonald's death. "It is time to turn our pain into power," union president Karen Lewis said. She encouraged union members to take part in the protest to "express their outrage and dignity." Lewis joined a call for a special prosecutor to look into McDonald's shooting and the subsequent investigation into it, and she slammed the arrests of some protesters who have taken to the streets in the nights since the release of the video. “Instead of responding in an open and understanding way to the wave of protest that has unfolded after the release of the video, we have seen the arrest of leading activists. We are alarmed at the criminalization of protest,” Lewis added.